This exciting day-cruiser has been designed to satisfy the demands of the expert boater, and is able to offer a modern design where all the internal and external fittings share the same concept while is capable of outstanding performances in spite of its relatively small engine. The Gobbi Research and Development Center has its unique design and engineering style, and is able to create sharp and dynamic boats with a superior building technology. The 225 S is no exception to the rule. The natural design balance of all the boat's particulars is, probably, its most interesting feature. Every detail has been studied, even those apparently obvious. The cabin entrance and the practical access to the fore deck with their innovative concepts are just two examples. 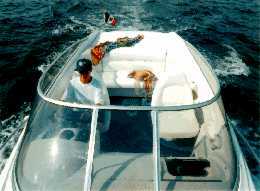 The boat is equipped with refined fittings, while its sleek lines are pleasant in their roundness. The aft portion feature an ergonomic settee just in front of the sun-bathing area which hide the technologic engine compartment. Below deck there is plenty of space, usually not found on a 6.8 meters L.O.A. 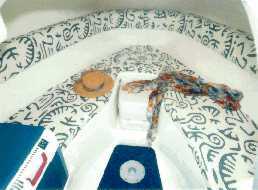 boat, with day and night areas which invite to pleasant cruises for two persons. The excellent hull, on the other hand, has shown its character, achieving outstanding overall performances: the top speed, maneuverability and seakeepness ensure safety and fun in all condition. "Sun" and "Future": these two words perfectly fit this new Gobbi 225 S.
Tested boat price: (VAT not included) 55.300.000 Lit. Construction material and detailing: fiberglass structure, stainless steel handrail, windshield with center opening. Lockers number and place: cockpit: safety equipment locker, 3 large lockers. Anchor chain locker. Cabin: chemical toilet locker, refrigerator locker, general purpose lockers. Deck: handrail, windshield with central opening, cockpit settee, aft sun-bathing area, grabrail, cockpit sink, swimming- platform shower, fully hidden swimming ladder. 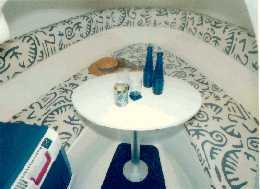 Interiors: bow convertible V berth, w.c. area, predisposed refrigerator installation, lockers and lighting. 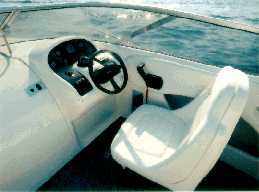 Steering comfort: the steering station is placed in the cockpit with adjustable seat, hydraulic steering, complete engine monitoring instruments and gauges, compass, log, hours-counter and horn.